The Ripley Wolves can close out their Senior AA semi-final with a win tonight after a 7-4 win in Game 5 on Friday. The Wolves and Thundercats traded goals all night, but Ripley finally pulled away in the third on their way to a 3-2 lead in this fast-paced, hard-hitting, exciting series. Ben Hughes led the way with a hat-trick for the Wolves, with singles going to Dan Nicoloff, Brent Walton, Nick Seiler and Gerrit Satosek (empty netter). Assists went to Cody Britton (3), Jeff Alcombrack (2), Walton (2), Garrett Meurs, Nicoloff, Blake Nichol, Hughes, and Tyler McCarthy. Ryan MacDonald got the win between the Wolves’ pipes. The Wolves can wrap up the series with a win in Game 6 tonight, Saturday, March 16, in Durham. The puck drops at 7 p.m. If necessary, Game 7 will be held in Ripley on Sunday, March 17, at 6 p.m.
Up-to-the-minute scores are available by following the Wolves on Twitter @RipleyWolves. The Ripley Wolves have tied the WOAA Senior A semi-final at two games apiece after a 6-3 win on Sunday night before a capacity crowd at home. Cody Britton led the way with four goals (including an empty-netter) as the Wolves battled hard to even up the series. Singles were added by Brent Walton and Ben Hughes, as Ripley finally saw some of their many shots pour into the net in the third period, when they scored five of their six goals. Assists went to Dan Nicoloff (2), Hughes (2), Garrett Meurs (2), Tyler McCarthy (2), Nick Seiler, Jarred Colling, Jeff Alcombrack, and goalie Ryan MacDonald, who was excellent in the win. Game 5 is Friday, March 15, in Ripley, at 8:30 p.m. Game 6 is back in Durham on Saturday at 7 p.m., and Game 7 will be Sunday, March 17, at 6 p.m., if necessary. The Ripley Wolves couldn’t hold a two-goal lead and lost Game 3 in Durham by a 3-2 score on Saturday night. The Wolves jumped to a 2-0 lead in the first on goals from Brett Catto and Tyson Soers. Assists went to Cody Britton, Gerrit Satosek and Dylan Sayle. That was it for offence for the visitors though, as Durham chipped away with a goal in the second and one midway through the third on Wolves netminder Ryan MacDonald. Then, with just 1:47 left on the clock, Durham took their first lead of the game, which they would not relinquish. Durham now leads the series 2-1, with Game 4 being held today, Sunday, March 10, at 6:30 p.m. in Ripley. It’s part of a huge day of hockey at the Ripley Arena, with the Atom Rep OMHA semi-final at 2:30 p.m. (lead series five points to three in a race to six), Novice Rep WOAA playoffs at 3:30 p.m., and a Bantam Rep WOAA game at 4:30 p.m., followed by the Wolves. Today’s game is sponsored by the Nuclear Waste Management Organization. 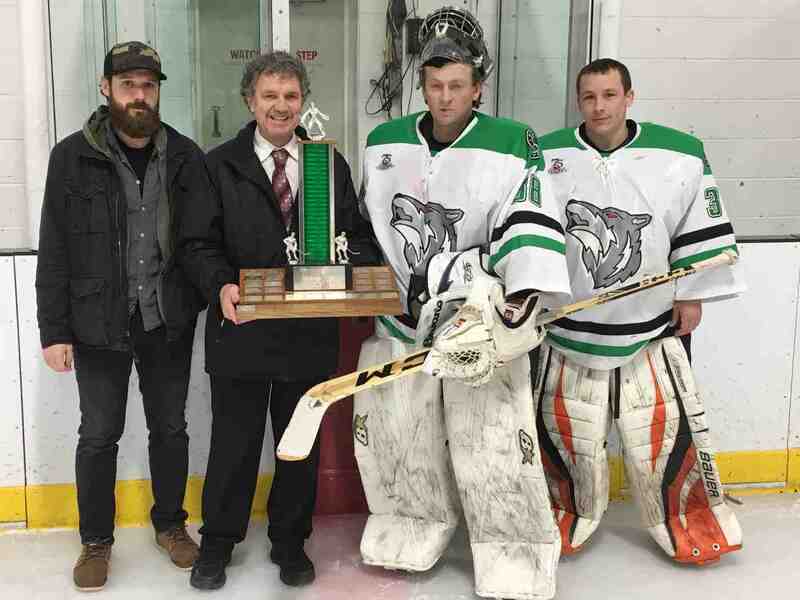 Ripley Wolves goalies Kurt Edwards, left, Ryan MacDonald and Jason Hamilton, receive the WOAA Senior A Goals Against Average award on Saturday, March 2. Ripley Wolves goalies Kurt Edwards, Jason Hamilton and Ryan MacDonald were handed the WOAA Senior A Goals Against Average (GAA) award before Game 1 vs Durham on Saturday night. The trio were the best set of goaltenders in the league this season, combining for a 2.77 GAA in 22 regular season games. The Ripley Wolves are Durham Thundercats are tied at one game apiece after the Cats snuck out a 6-5 overtime win on Sunday night. The T’Cats scored with 38 seconds left in the third to tie the game, and then won it in overtime. Ripley’s goal scorers were Jeff Alcombrack, Brent Walton, Brett Catto (2), and Garrett Meurs. Assists went to Gerrit Satosek (2), Cody Britton (2), Walton (2), Dan Nicoloff, Alcobrack, Meurs, and Catto. Jason Hamilton took the loss in the Wolves net. Game 3 returns to Durham on Saturday, March 9, at 7 p.m. Game 4 is back in Ripley on Sunday, March 10, at 6:30 p.m. Game sponsor is the Nuclear Waste Management Organization. The Ripley Wolves took Game 1 of the Senior AA semi-final after scoring six unanswered goals in a 6-2 win over Durham. The Thundercats came out flying and jumped to a 2-0 lead midway through the first, before Dylan Sayle pulled the Wolves to within one by period’s end, with Gerrit Satosek and Pat Looby getting the helpers. Brett Catto tied it up early in the second from Ben Hughes and Garrett Meurs. Five minutes later, Brent Walton one-timed home a ridiculous cross-ice, slap-pass on a two-on-one from Keaton Willis, giving the Wolves a 3-2 lead they’d take into the third period. Meurs gave Ripley a bit of breathing room with a breathtaking shorthanded, unassisted goal midway through the third. Meurs took the puck at his own blueline, battled the Durham defenceman for positioning, cut to the middle of the ice before beating a second defenceman. He then walked over the Thundercats line with a man draped on his shoulders, and rifled a snapshot under the bar behind Durham’s goalie. With the Cats now down 4-2, they began pulling their goalie whenever they’d have a faceoff in Ripley’s zone. The high-risk, high-reward strategy did not pay off for them in the final seven minutes, as Ripley added two empty-netters – Catto from Nick Seiler and Tyson Soers, and Soers from Ben Scheel. Though Ripley had long stretches of sustained pressure in the Durham zone, Wolves goalie Ryan MacDonald was called upon many times to keep the Wolves in control, and he answered the bell every time, especially during those long stretches of Durham playing with the extra attacker. Thanks goes to Kincardine Home Hardware, which sponsored Game 1. Game 2 goes tonight, Sunday, March 3, at 8:30 p.m. in Durham. Game 3 will be back in Durham on Saturday, March 9, at 7 p.m., with Game 4 at the Ripley arena on Sunday, March 10, at 6:30 p.m. The game is sponsored by the Nuclear Waste Management Organization. The Wolves executive will hold its March Quiz Night on Friday, March 8, so let Dwight Irwin know if you’d like to reserve a table. The schedule for the WOAA Senior AA semi-finals vs the Durham Thundercats has been set. The winner will face the winner of Clinton and Saugeen Shores.